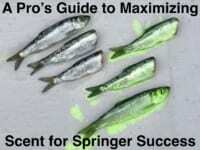 Not every body has access to lots of salmon eggs. And, to be honest, it’s pretty hard to run guided trips daily without bait. Sure, we can run Mag Lips or beads, but good eggs is our go to. Here is a quick blog on how to get the most use out of skeins. 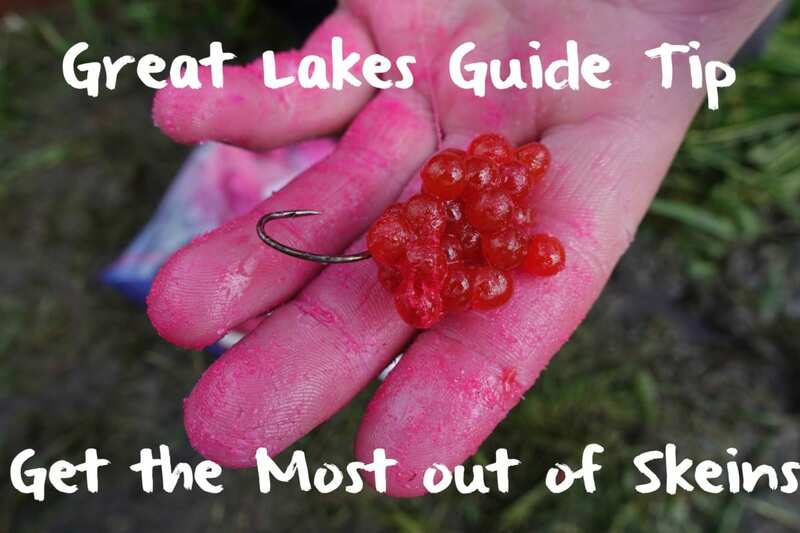 Most guides in the Great Lakes use skein for salmon, but prefer loose eggs tied in sacs for steelhead. 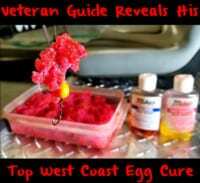 Here is a great way to get salmon and steelhead eggs out of the same skein. As a charter captain we start keeping skeins from the mature kings we catch on Lake Michigan starting in July (as long as they look mature enough). At this time the eggs are still pretty tight in the skein and make great chunk skein after we cure them in Fire Cure. As the summer goes on and the eggs start to get larger the top layer of eggs starts to slightly pull away from the skein. Some may even fall off. At this point we get what I call a 2 for 1. What do I mean by 2 for 1? When skeins reach the point where the eggs on the top start to loosen up we can scrape the top layer with a hardware screen to get a pile of loose eggs. I continue to scrape them down until the point they are not coming off easily anymore. This gives me loose eggs, but also plenty of eggs still connected to the skein. In short, the loose eggs can be tied in netting for steelhead and the eggs still in the skein can be used for salmon. Then there’s no waste. I roll the loose eggs on a paper towel. This removes any remaining blood. I then put them in front of a fan for a few minutes to dry them out. After they have dried a bit I cure them with BorX O Fire (remember, these are for steelhead). After a few days in the fridge if I’m not going to use them soon I freeze them. Now that we have scraped the loose eggs there are still some eggs attached to the skein. I’ll place the skeins on paper towels to dry them and remove any remaining blood. After 15-20 minutes in the paper towel lay them out on freezer paper and cure them with Fire Cure. Make sure to work the Fire Cure into every little crevice. Then place the cured skein into a Ziploc and put in the fridge for three days. After three days I pull them out and place them on paper towel again for an hour. Then coat the skeins in BorX O Fire. This toughens up the skeins and helps keep it together. They are now ready to catch kings. Hope this little tip helps you get the most out of your bait and put a few more fish the net this season. Editor’s Note: Captain Kyle Buck operates Great Lakes Guide Service out of Muskegon, Michigan. For more information on his Western Michigan salmon trips please visit www.glguideservice.com.